The Billy is known to be an elegant scenthound with long ears, muscular legs, and smooth, short fur. They have a medium length snout with a nose that can either be brown, reddish brown, or black. Unlike many other scent hounds, their top lip does not hang far below the bottom lip. The main color in the Billy dog’s fur is a shade of white. They can appear to be pure white, off white, or a more tan white. They can have spots of a variety of colors including orange, brown, or a light yellow or tan. The Billy dog is very intelligent, especially when it comes to hunting. They can hunt easily in packs and are known to change the volume of their howl or bark depending on the prey that they found. They are very loyal to their owner and make strong bonds with humans. They are also very gentle and kind dogs that are great with kids. Because they are often used as hunting dogs, be sure to be watchful if they are around small animals as they may try to hunt the animal out of instinct. These dogs can be easily trained as long as they have a patient teacher. They can become distracted, like most scent hounds, and require repetitive teachings and strict rules in order for them to be at their best behavior. They are also independent by nature so they may seem stubborn when trying to train them. These dogs are not known to have very many health issues. As always with medium to large size dogs, be sure to stay aware of joint problems such as hip dysplasia. These dogs have long droopy ears which can collect bacteria easily so be sure to check for ear infections every once in a while. Since Billy dogs are high energy and need space to run, they do best living in a house with a backyard. They can also live in cities easily as long as they have an outdoor space to explore. They would not do well in an apartment as they would have less space to run and exercise. This dog is a high energy dog and requires plenty of exercise, both mental and physical. Be sure to take them on daily walks, let them run free in a large area of land and teach them commands and tricks in order to stimulate their brain. These dogs have short hair and require little to no grooming. Keep their ears clean, nails trimmed and bathe them when necessary. The Billy dog breed originated from the King’s White Dog which was used as a pack hunting dog for royalty and nobility in France during the 1700’s. Because of the French Revolution, this hunting breed went extinct, leaving their genes only in other mixed dog breeds. 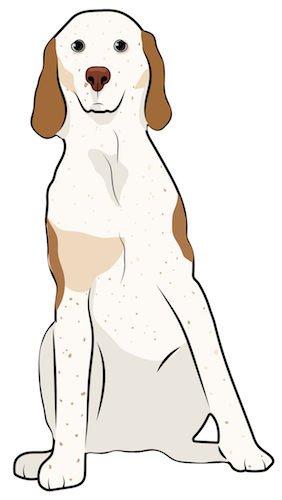 From these mixed dog breeds came more developed hunting dogs and scent hounds for the future. The breeding of the almost extinct King’s White Dog was bred with other dogs starting in the 1800’s. They bred the King’s White Dog with Swiss hounds and named this breed Ceris. By taking the Ceris and breeding them with various other breeds such as Layre breeds, and the Montemboeuf, the first Billy dog was born. We can thank Gaston Hublot du Rivault for this new dog breed with an exquisite nose and strategic hunting abilities. The Billy Dog was bred to hunt in packs, specifically hunting large game such as boar and deer. As the Billy dog gained popularity, more and more French citizens used these dogs to hunt in the countryside. They were, and still are, multi talented in hunting a variety of game such as hare, deer, wolves, boar, and anything in between. By 1886, a breed standard had been written for the Billy dog. This meant that the traits of this dog breed would stay relatively the same as time went on. During the 1900’s, both world wars played a devastating role on the Billy breed. Because the Billy dog was mainly used in France, there were limited opportunities to ensure that the Billy breed survived. Reportedly, only ten Billy dogs were alive after World War II. 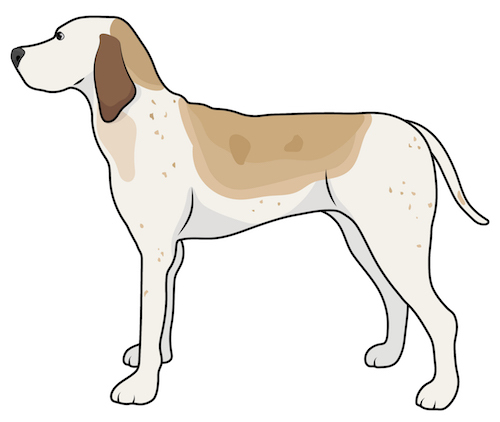 Because of this major loss, other breeds were possibly used in the revival of the the Billy dog. It is possible that both Poitevin and Harrier hounds were used to produce more Billy dogs quickly. Thanks to the reviving of the breed, Billy dogs are no longer endangered, even though they are rarely found outside the French borders. In 1973, the Federation Cynologique Internationale recognized the Billy dog and in 1996, the United Kennel Club did the same. Today, the Billy dog is still used for pack hunting, mainly in the French countryside.